Would highly recommend this table set. It is a lovely set that is very sturdy. I like that the bar stools swivel...which is a plus ! I use it a lot as a game table. Thinking about getting other pieces to it. 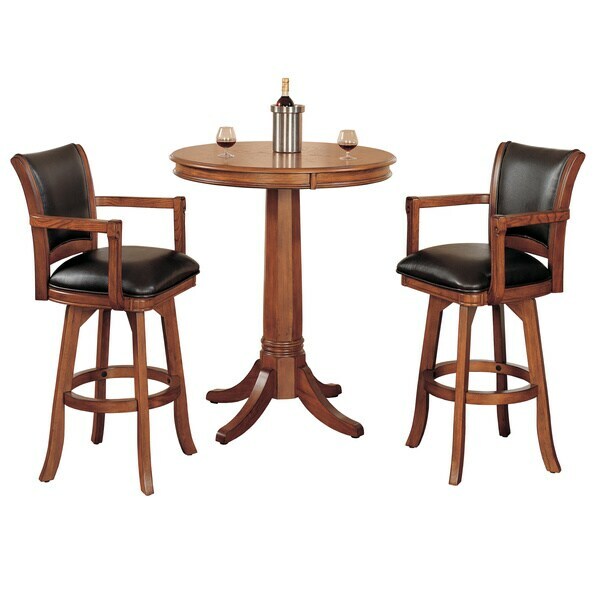 Add traditional charm to your bar, game room or kitchen with the three-piece Park View Bistro Set. Finished in a medium brown cherry with deep brown leather seat cushions and backs, the swivel stool and table set combines comfort with casual living. This set is terrific. Pretty easy to put together, we did wood glue the joints and not sit on it for about 24 hours. We've had the set for a couple years now, and we have dinner on it about half the nights of the week, we've had multiple beer and football parties on it, and it has stood the test of time. For the price this is an amazing set.....you will not be disappointed! Loved the styling, the pedestal center, leather seat/back! "Will i get a discount for first-time shopping "
Hello, you will be contacted by Customer Care. Have a great day.